Given that the effects of Getafix's potion are permanent on Obelix since he fell in it as a child, why didn't the Gauls throw all of their children in the potion? By doing so, in about 15 years they would have an army of super-Gauls with which they could easily annihilate the Roman army. Is there any in-universe explanation as to why this isn't an option? Simple: because that was a pretty lucky accident that probably is too risky to attempt to replicate. The first one is a retelling that explains HOW Obelix felt in the cauldron when he was about 6. The story is narrated by Asterix, apparently to the conventional readership, and tells that in childhood, Obelix was often bullied by other boys, until Asterix, to assist his courage, induced him to drink some of the magic potion that made the villagers invincible. When they are interrupted in the act, Obelix falls into the cauldron containing the potion, and drinks it all, and is thereafter permanently under its influence. As you can see, Obelix actually drinks the magic potion, not just "bathe" in it (so, sorry, no Achilles reference). Now consider what happens in the second comic, Asterix and Obelix All at Sea. In the story, Obelix actually manages to drink an entire cauldron full with the aforementioned potion. The results? First he gets turned into a stone statue, and then in a kid version of himself. 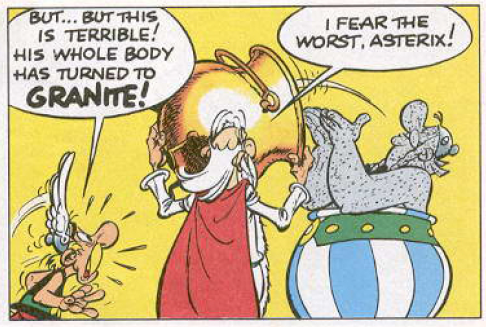 You may say that that effect was due to Obelix already having super-human strength when he drank the second cauldron... but the same comic show the same destiny happening to Crustacius, a roman Admiral- who never fell in a cauldron when young! So, apparently, drinking too much magical potion in a single go may have dire consequences. Based on the results, you may even say that it will have dire consequences most of the times! This is somehow implied in multiple occasions during the series: every single time Obelix is given some magical potion (for example during the pyramid escape in Asterix & Cleopatra) Panoramix (or Getafix if you prefer his English name) always try to give him as little potion as possible (hinting he may already have feared that overdosing it may cause problems). It is also worth noticing that even when Obelix originally fell in the magic potion that wasn't without side effects either: before the incident, Obelix is shown as being extremely pacifist. While that personality trait may just originate from fear and the inability to defend himself, it is undoubted that he changes after gaining his characterizing strength. Even his usual over-the-top reactions to being called "fat" - "WHO ARE YOU CALLING FAT" - seems to be something he developed after the incident. Obelix isn't very bright, and this could be a result of the overdose of strength potion, as could his obesity. Few parents would want their children to become super-strong at the price of them becoming fat and stupid. There may be some unknown long-term effects, such as sterility or early death from heart failure, and, following the principle of caution, parents refrain from exposing their children to this risk. Apart from Asterix and Obelix, few of the Gaul villagers ever seem to leave the village's environs. Since Getafix's potions generally are easily available in times of crisis, there is no need to dose up permanently, no more than there is a need today to wear combat armor all the time. And then there is the obvious out-of-universe explanation: The stories wouldn't be fun if all the Gauls were super-strong all the time. TL;DR: The universe of Asterix is not meant to be consistent. The author of the Asterix comics did not set out to create a logically consistent universe. His writing lends itself more to parody and one-time problems the heroes have to face. Our tendency as fans of a particular story (and by extension, its universe) is to seek logical truths that we can use to envisage all kinds of scenarios that the original author did not intend. Very few authors start off by first creating the laws of a universe, and then creating its characters and dilemmas. An easy example of this I can quote from Asterix itself: in one of the comics (It was one where Asterix and Obelix where in Rome, I cannot remember which) the simplest outcome would've been to storm Caesar's palace and take what they needed to complete the quest; Obelix tries this route, but Asterix stops him, saying "these guards are a lot tougher than what you're used to at home" (who can imagine anyone standing up to Obelix??). This tells us the heroes have to face certain trials, even with the help of a potion that makes its user invincible. It's a moral thing. Gauls are not to use the power of the potion for anything, but to defend themselves. It mustn't be used to fight each other. Getafix is very clear about that. I think that is the answer. And: it must be very annoying to have superpower in everydaylife. Remember how often Obelix destroys doors and other stuff. The Gauls stood up against the Rome because they choose to give themselves and their children the freedom to live their life the way they see fit. Forcing them to become eternal warriors would go against anything they could ever want for anyone, maybe the kid you just forced to become an abomination would have liked to become a bard but now he crushes any Instrument he touches. Not the answer you're looking for? Browse other questions tagged comics asterix or ask your own question. Why don't more villains die/become crippled? How do speedsters work in comic books? Why aren't the flaws of the science examined? Why aren't Marvel heroes more concerned with everyday life?